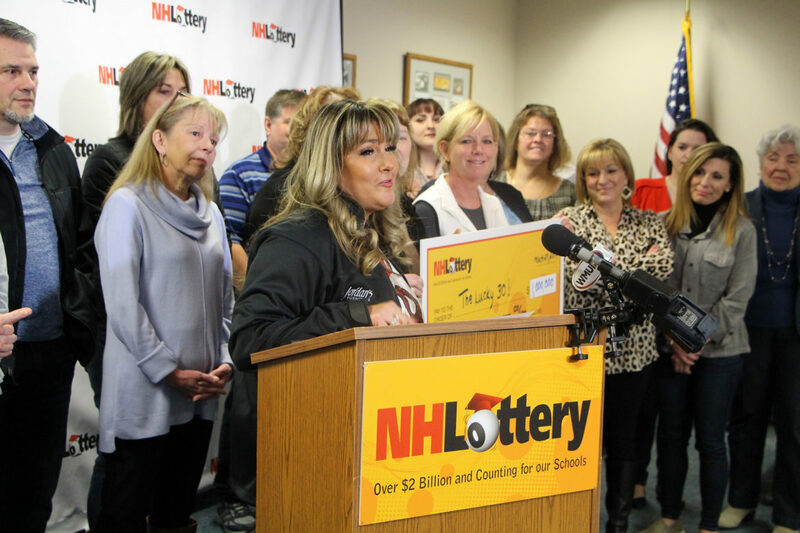 A 30-person winner pool, dubbed “The Lucky 30,” comprised of employees at Jordan’s Furniture in Nashua claimed a $1 million Powerball prize today at New Hampshire Lottery headquarters. The New Hampshire Lottery made a formal check presentation to the group today, with about 20 members of the winner pool present. Pictured here, Carrie Perry of Lowell, Mass., who is one of the winners, answers questions from the podium. The largest Powerball jackpot on record was $1.586 billion in January 2016, which remains the world record lottery jackpot. Powerball drawings are held Wednesdays and Saturdays at 10:59 PM ET. Tickets are on sale at more than 1,400 retailers statewide, and online at iLottery. For more information and to play, visit www.nhlottery.com.